DARPA – the Defense Advanced Research Projects Agency – is known for designing a variety of high-tech and futuristic platforms for the US military. One of the most recent projects from DARPA? An oceangoing drone ship specially designed for submarine hunting by engineers at SAIC. The ship – dubbed the ACTUV sub-tracking drone – is specifically built to monitor very quiet diesel-electric submarines. In terms of real-world scenarios, the Navy would deploy sonar buoys around a specific area to give the drone ship an idea of where to search. After the search area is defined, the drone ship would be capable of taking over the search using long-range and short-range sonars for up to 13 weeks at a time. The ship is also able to detect and gauge the intent of other ships in its path, with human failsafes built into the system. 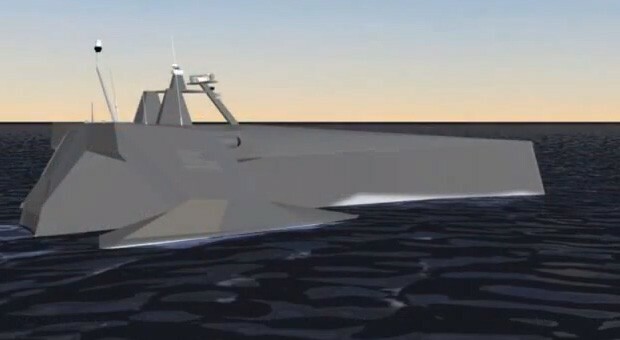 The ACTUV is currently categorized as a work in progress, so it will be years before the vessel is actually ready to plow through the oceans searching for enemy submarines. SAIC says the ship won’t requires human interaction or maintenance for the entire term of its 60 to 90 day deployment. Indeed, the only time human assistance is needed during the ACTUV mission is when the harbormaster escorts the ship out of the dock. This entry was posted in US Submarines, Video Clip and tagged ACTUV, DARPA, drone, Video Clip on January 1, 2013 by jasonlockley.